When the bullet missed Chris Brown’s head by millimeters, it set him on a course toward teaching criminal justice and working to end the gang violence on the streets of Los Angeles. The bullet ricocheted off a wall in the Imperial Courts housing project in Watts and headed toward a group of teens. It passed through the bushy Afro of a boy named Gregory Chris Brown, missing his skull by millimeters. It was not the first time Brown was shot at or faced down a knife. He’d been raised in Watts Willowbrook after all, the son of a woman who was only 13 when he was born. But, Brown says, it was the closest he ever came to death and is one of the reasons he not only teaches criminal justice at Cal State Fullerton now but also works to end the gang violence on the streets of Los Angeles. In August, the 56-year-old Brown was recognized by L.A. Mayor Eric Garcetti for the work he does with the Southern California Cease Fire Committee, an anti-gang violence coalition. “The only difference between me and a gang member is that I chose to get an education,” Brown says. Brown (Oakes ’81, sociology) is 6-foot-3 with a deep radio-announcer voice and a penchant for wearing suits and ties to work. It’s far cry from the way he grew up. His mother was 12 when she was impregnated by an older man and was 16 when she married Brown’s stepfather. She worked as a janitor and at convalescent homes. Brown, whose first job was selling candy door-to-door at the age of 10, says he sometimes made more money than she did. She was “a strong woman, a godly woman,” Brown says, but could be as tough as a drill sergeant. It was his fear of her displeasure and also his love for learning that kept him out of the gangster life, he says. 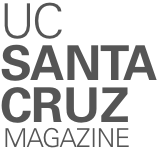 Introduced to UC Santa Cruz through the Educational Opportunity Program (EOP), he found mentors in Oakes College founding provost J. Herman Blake and the late writing lecturer Don Rothman. It was also where he met his wife of 31 years, Nora Lake-Brown (Oakes ’81, economics and environmental studies). Today, Brown teaches criminal justice courses at Cal State Fullerton and does research into gangs, including a study of the sometimes-violent effects of social media on gang life. Brown is a walking advertisement for the idea of investing energy in others. Besides volunteering as a church elder and serving on the boards of various nonprofits, Brown is just as likely to bring home a stranger in need. Nearly every year since 1977, Brown also has served as an usher at the Oakes College graduation, parting the crowds to lead the processional. “For me, seeing Chris every year at commencement is really a renewal of our shared commitment to the type of powerfully transformative education that Oakes represents,” former Oakes Provost and Professor of Literature Kimberly Lau says.